After a downbeat Christmas, there is a small signal that things are looking up for retail at the start of 2018. According to two established consumer indicators, GfK and Yougov/CEBR, January saw an uptick in consumer 'confidence'. This is not a forward indicator of spending. As has been pointed out in this blog before, instead it is a real time measure of consumers' feelings here and now. With a few blips, there is a strong direct relationship between consumer 'confidence' and retail sales volume growth in the same quarter. 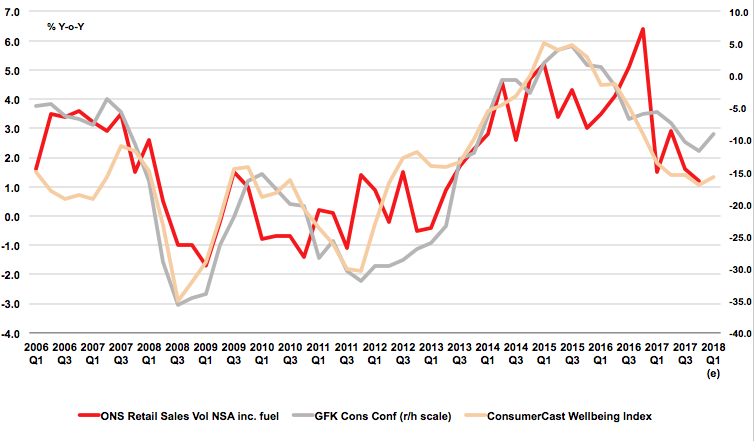 The indicators are down from their peak in summer 2015 but have both, at the same time, turned upwards – in the case of GfK's measure, quite strongly. The fact they have done this simultaneously suggests the improvement is real, not a quirk. So, what is driving this? ConsumerCast's Wellbeing Index, combining annual growth in net household income, price inflation and the change in the unemployment rate, also moves in line with 'confidence', implying very strongly that consumers are looking backwards at what has happened, not forwards, when they are talking to GfK and Yougov. If you factor in a small decline in the rate of inflation for Q1 as is expected from most forecasters on the basis that it peaked in November, the Wellbeing Index also shows a recovery. In reality it may be a mixture of two things: an easing in the rate of price rises and a continued strong jobs market (the latest figures for November showed much faster employment growth). If the jobs market carries on on its current course, as business surveys suggest it will, and inflation trends downwards, you can expect 'confidence' to improve and with it current trading volumes. But no, January's consumer 'confidence' figures cannot tell us anything significant about what they will do in future. Whatever they indicate is happening right now or has already happened.